Steve Grabell, CFO of NFI, a leading supply chain solutions provider, was recently recognized as a recipient of the Philadelphia Business Journal CFO of the Year Award. Steve is more than just a CFO. He truly embodies what NFI stands for and has contributed tremendously to NFI’s growth and strong position as a leader in the supply chain industry. Steve Grabell, CFO of NFI, a leading supply chain solutions provider, was recently recognized as a recipient of the Philadelphia Business Journal CFO of the Year Award. Grabell was chosen by the Business Journal editorial team according to financial accomplishments, tenure and scope of responsibilities, leadership, respect and influence within the company, community involvement, and stewardship of the company’s business model. An awards ceremony honoring the winners took place on Thursday, June 12 at the Loews Philadelphia Hotel in Center City. Joining NFI in 2008 as CFO, Grabell is a strategic advisor who leads a variety of financial and administrative functions, as well as corporate initiatives with a primary focus on continuous improvement and strategy development. 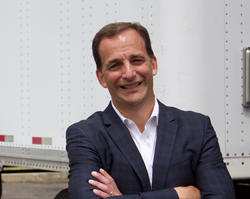 During his tenure, he has spearheaded seven acquisitions including NFI’s largest to date with the 2017 acquisition of California Cartage, continuing NFI’s expansion on a global scale. NFI offers extensive experience providing supply chain solutions across a variety of sectors, spanning food and beverage, retail, consumer packaged goods, and manufacturing. The company’s integrated suite of services includes dedicated transportation, distribution, transportation management, brokerage, port drayage, intermodal, global logistics, and real estate. About NFI – NFI is a fully integrated North American supply chain solutions provider headquartered in Cherry Hill, N.J. Privately held by the Brown family since its inception in 1932, NFI generates nearly $2 billion in annual revenue and employs more than 10,000 associates. NFI owns facilities globally and operates 41.5 million square feet of warehouse and distribution space. Its dedicated and drayage fleet consists of over 4,000 tractors and 9,000 trailers. Its business lines include dedicated transportation, distribution, transportation management, port drayage, intermodal, brokerage, global logistics, and commercial real estate. For more information about NFI, visit http://www.nfiindustries.com or call 1-877-NFI-3777.